The sky lit up on the evening of Sunday, September 20, as Nepal became the youngest republic in the world. The noise of the firecrackers that exploded above the ceremony venue drifted through the air and made its way into the home of an 80-year-old woman in Old Baneshwor. Whatever it was, the ringing in of the constitution was a significant day for Shrestha, one of the trailblazing feminists of Nepal. It was the start of another chapter in a life that has witnessed all of the important happenings in the last sixty-five years. For both those who have and have not heard of Shrestha: she is a living legend. With more than six decades of struggle for freedom, Shrestha, who was close to becoming the vice-president in 2008, is a custodian of Nepal’s history. A revolutionary known for wearing her heart on her sleeves, Shrestha is a witness and an active agent of Nepal’s struggle for democracy and for women's rights. Shanta Shrestha, born in 1935 to revolutionaries Mohan Maya Shrestha and Anandlal, attended one of the first schools in Nepal, Shanti Nikunj. At Shanti Nikunj, under the tutelage of a group of teachers who were fiercely devoted to the idea of democracy and republicanism, Shrestha fostered her dedication towards freedom. “I have fought for republicanism ever since I understood what it meant,” she says. A picture that hangs on one of the walls of her room serves as proof. It is dated 1947, when the Rana regime was still in control. In the picture are founding members of the ‘Nepal Women’s Association’ who had gathered under the pretext of a picnic. These women were actually finalising the formation of a women’s organisation to demand their equal rights. We are talking of a time when women, once they came of age, were barred from leaving the house without a male member. This group had broken all rules. That very year, women from this association marched to authorities to demand suffrage for women. Shanta Shrestha, barely 12 years old, was the youngest member of the delegation. When King Tribhuvan escaped to India with his family, his supporters and advocates of democracy had started protesting against the Rana regime. The police, in an attempt to control the crowds, had taken out their guns. Shrestha had then gone up to a policeman, grabbed him by his collar, snatched his gun and looked inside the gun: there were no bullets. Upon, realising that it was a false alarm, informed the others. It wasn’t only the king that took notice. The photograph incident had everyone talking about these revolutionary women and, soon after the aerodrome incident, an arrest warrant was placed on Shrestha, which compelled her to go underground. She resurfaced only several months later, after Nepal was declared a democracy in 1951. For the next five years, Shrestha was present at every protest with other members of the federation. She remembers the first time when the riot police had to use water cannons. The women were protesting against an alliance formed between the Nepali Congress, the monarchy and the Ranas. “Oh, that was when the police released water cannons. I could feel my skin peeling,” she says. “How painful it was. But did it deter us from fighting? Not at all." “Whenever there was a protest, she was there,” says Prayag Raj Singh Suwal, a former minister from the Panchayat era. The declared democracy did not last long and Nepal slipped into the Panchayat system. After that, Shrestha worked at Radio Nepal for three-and-a-half decades as a program producer. For eight years, she hosted a daily one-hour show on which she discussed women’s issues.“I remember hearing her distinct voice on the radio,” says Dwarika Man Pradhan, who was then a student. He is now one of the five trustees of the Shanta Shrestha Trust. "She couldn’t say the things she wanted to because everything had to be approved by the palace, and all the programs were scripted, but there was sternness in her voice. You couldn’t help but listen to her. You could tell that she was fierce,” says Pradhan. 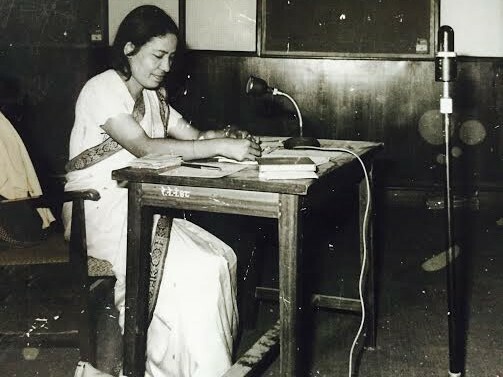 At Radio Nepal, she went on to establish a worker’s union. “She doesn’t know how to be politically correct. She says whatever is in her mind which might not go well with everyone, but she has the purest heart,” says Pradhan. Shrestha’s seven decades of experience, political analysis and critique is recorded in the 13 publications to her name, which includes an anthology of 108 poems, a collection of 30 stories, plays, memoirs and reflections. In 2008, Shanta Shrestha, at the age of 73 who was also a member of the interim legislature parliament (independent candidate) filed her nomination to contest for vice president on behalf (of then) CPN-Maoist. She lost to the current vice president Parmanandha Jha. Since then, she has been living a quiet life. She is visited periodically by admirers and people who want to listen to Nepal’s history from someone who has lived through it. It was these people--family and friends--who insisted that she open a trust so that her legacy could continue. “I had never really thought about opening a trust, but then people told me that I could inspire women. That is when I decided to go forward with it,” she says, pointing at a huge pile of unpublished work. These unpublished writings, stacked next to newspaper cuttings, old photographs, certificates of felicitations, and notes take up a huge space on the fourth floor of a building where Shrestha lives by herself. She never married. “She is legendary. She is inspirational. In fact, I think she deserves to be the next president of Nepal,” says Bishnu Hari Nepal, a former ambassador to Japan, who has known Shrestha since the 1970s. Like some of her admirers, Nepal likes to visit "Shanta didi" at times and listen to her. Her eyes light up as she narrates stories from her past. She will talk more about others rather than herself. Of the martyrs we lost, of the secrets meetings of the Praja Parishad--the first attempt to establish an organisation to stand up against the Rana regime, of men and women who were willing to sacrifice their lives for Nepal, of the other trailblazing feminists who sneaked out of their homes to participate in protests. She will also note, with a hint of sadness, of the leaders who promised, but falsely. “I have yet to find a dedicated and committed leader in Nepal,” she says. Shanta Shrestha is a storyteller. She has a lot to tell.